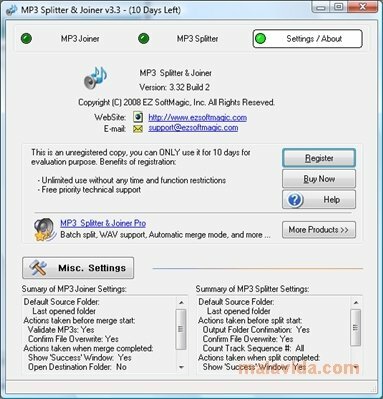 MP3 Splitter and Joiner is a simple and effective audio editor capable of cutting and pasting files in MP3 format. 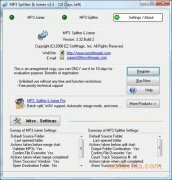 Easy to use, it will allow you to split your favorite songs into different parts, or to join a selection of different files to build a single MP3 file. It's an easy-to-use application that avoids the loss of quality from your files during the process. You'll be able to work with files that weigh up to a total of 2 GB, and it's capable of supporting variable bit rates, so that you'll be able to get the maximum quality from your files. - Capable of cutting files into fragments of the same size, whether by means of the song's timeline or by determining the amount of segments that are needed. - Automatic file analyzer to select the best possible editing mode. - Capacity to import information about your files directly from a CUE file, as well as being able to extract that file again from the metadata. - Insert silences in a track, with the possibility to adjust their length. The trial version can only be used during 10 days. Technical support not available.